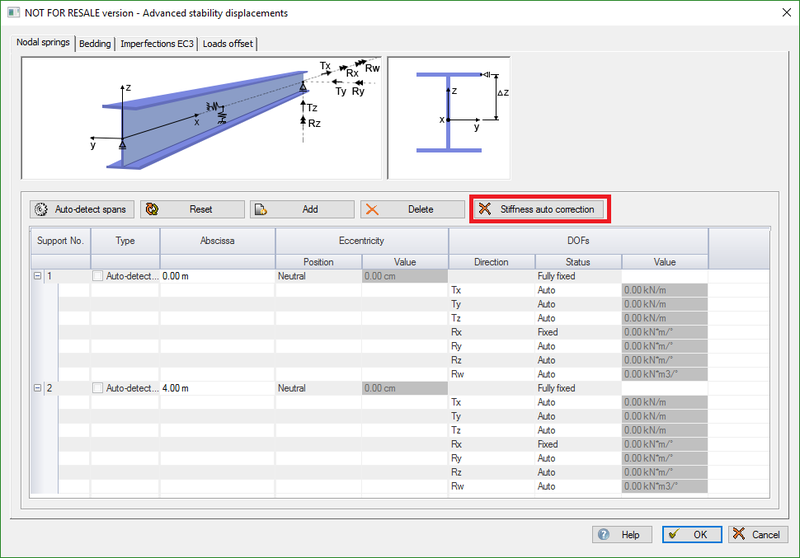 Although the "Advanced stability" from Advance Design feature considers the individual member, the intersections with the other elements are of course taken into account. In fact, the intersections are turned into nodal springs. The selected member has intersections with other elements at x = 0.00m and x = 4.00m. The "Auto-detect spans" button enables the users to see the intersections and alter the behavior of the corresponding springs. The users can also add or delete nodal springs (only user-added nodal springs can be deleted) from the grid using the "Add" and "Delete" buttons. Moreover, they can reset the grid with the help of the "Reset" button. 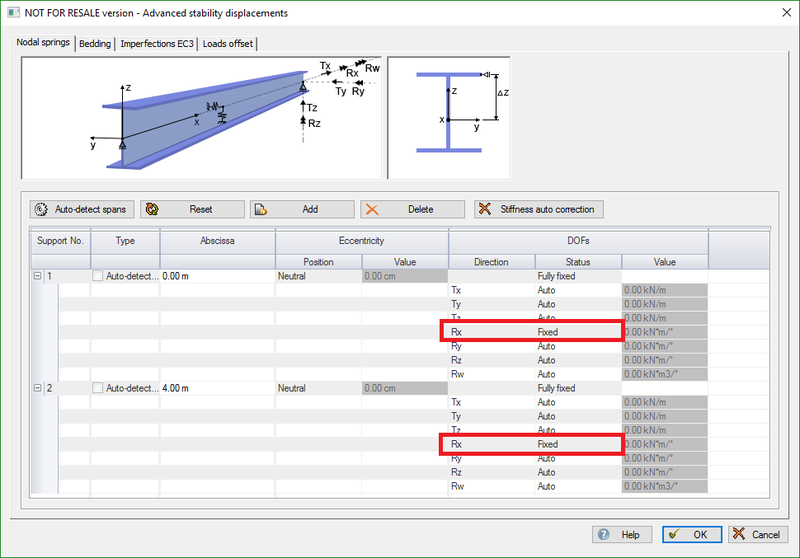 Note: Even if the user does not open the Advance stability definition parameters, Advance Design will automatically take into consideration the intersections with the other elements during the analysis. 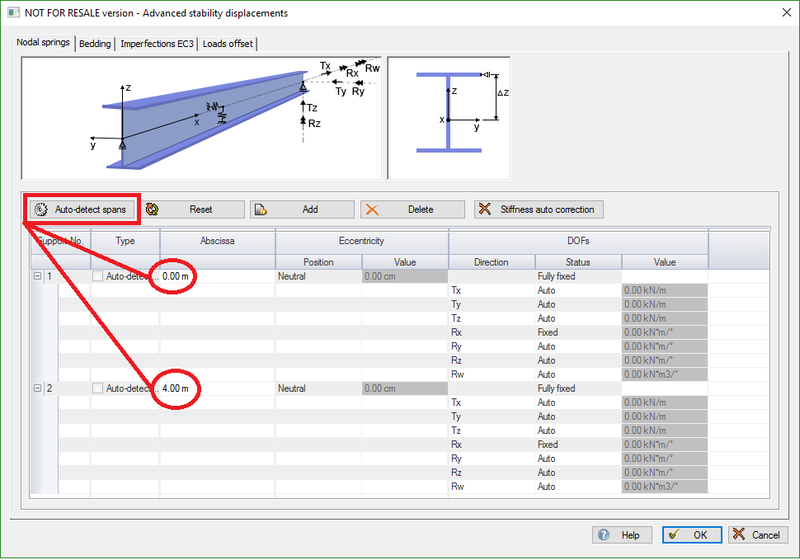 Note: If geometrical parameters are modified after the “Advance Stability” option is checked for steel members, “Reset” and “Auto-Detect Spans” options must be selected in order to reinitialize the position of the nodal springs. Any modifications made in the Advance stability window will be reset to default. Otherwise, the calculation will not be successful. For each nodal spring, the user can set the status for each of the seven DOF. Elastic: defines an elastic release for the considered degree-of-freedom (stiffness imposed by user). 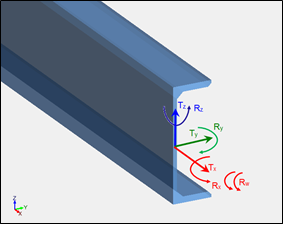 When set on "Auto", Advance Design is able to compute the appropriate stiffness of the release as Force/Displacement, resulting in a stiffness value for each combination. Warning: the "Auto" status means that the "Advanced stability" feature will attempt to re-create the boundary conditions based on the Forces and Displacements diagrams from the global model. This can be challenging in some cases as the automatic determination has its own limitations. The DOF is fixed but no force was acting in the given direction. Therefore, we would advise the users to manually set the free DOF"s on "Free" whenever possible as the "Advanced stability" feature is not able to import the boundary conditions defined on the member in the global model. The "Advanced stability" feature can only deduce the boundary conditions from the Forces and Displacements diagrams it imports from the global model. We would also advise the users to make sure the member does not feature a free "Rx" DOF on both ends as this could lead to a numerical instability if no other intermediate nodal spring exists. Setting the "Rx" DOF on "Fixed" can be a solution when the "Auto" detection method fail. The "Position" property enables the user to define an eccentric spring. Eccentricity is meant in the z direction (Upper fiber, Neutral, Bottom fiber or User value). 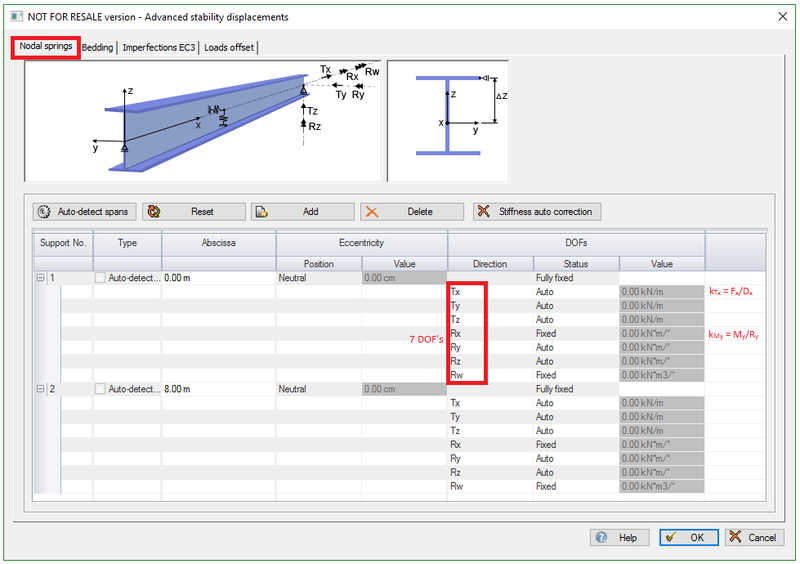 There are cases when, by activating the “Auto-detect spans” option, the automatically calculated stiffness does not meet the minimum criteria in order to successfully perform the 2nd order analysis (for example, when displacements are automatically imposed at an element"s ends for which the automatically calculated stiffness is insufficient). 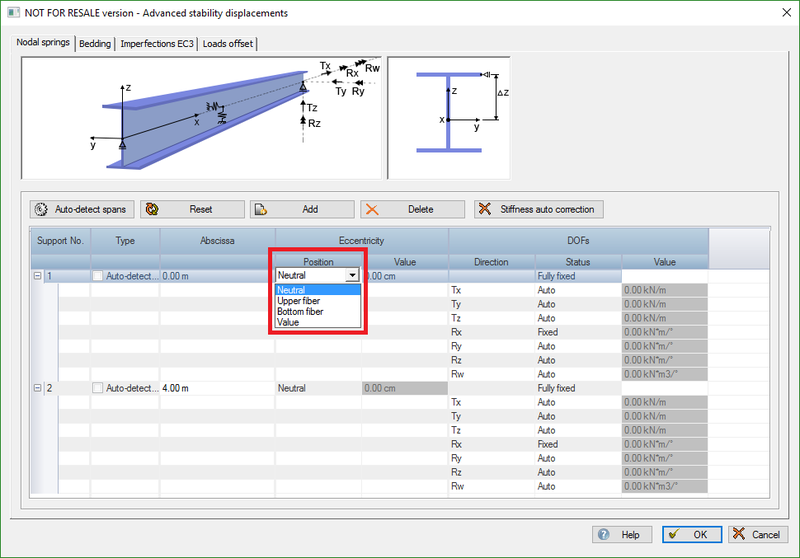 By activating the “Stiffness auto correction” option, the program automatically imposes a minimum stiffness in order to successfully perform the analysis, but only when the values are very small. Generally, the warping DOF (degree-of-freedom) is free and fixing it requires special rules for detailing, like the end plates, beam extensions, flat stiffeners.